We have since 2011 welcomed travelers around the globe to stay with us in our home. We find it fascinating and stimulating having the WORLD coming to us! When you visit us you are welcomed into our home! We hope to be able to give you some insight into our daily life at Overvoll and make your stay in our region a very special one - that makes you want to stay! .. and WOW! This is what our guests say about us! A homely, helpful and warm family home. This was the best night's sleep I've had in ages. 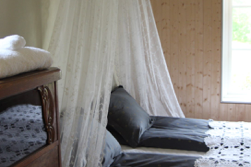 The farm was cosy and characterful, like sleeping in a Norwegian fairy tale. The evening meal was absolutely worth paying a little extra for - fresh home cooking with lots of care and attention to detail. Thank you. We highly recommend this special extraordinary place. Este alojamiento fue uno de los más gratamente sorprendentes que tuvimos la suerte de visitar durante nuestra ruta por los fiordos. Es una antigua granja semi-restaurada en mitad de la naturaleza. Nada más llegar, Hege Kristin, la propietaria que es una gran cocinera, nos preparó una cena crudivegana riquísima a base de productos ecológicos de su huerta. Esto fue algo totalmente nuevo para mi pero, para mi sorpresa, estaba buenísimo! Igual que el desayuno, con un montón de variedad y muy rico. Lo mejor que tiene esta casa es que compartes mesa y zonas comunes con los demás huéspedes y tienes la oportunidad de conocer gente de distintos sitios y culturas, lo que resulta muy interesante. Hege Kristin es una gran anfitriona, te abre las puertas de su casa para hacerte sentir como en la tuya y te explica un montón de cosas acerca de las costumbres y la cultura local. Me encantó este alojamiento y su filosofía y si puedo volveré porque éste es uno de esos sitios que se quedan grabados en la memoria. A wonderful and memorable stay! Delicious food and very nice host! Last week I was visiting Overvoll for 2 nights during my ten day -trip to Norway. If I had known before what kind of paradise it is, I had definitely skipped the rest and stay there the whole time. Now I have told everyone how beautiful and home-like it was. The breakfast was perfect with its little delicious home-made details, not to mention the introducing of the food we got to share. I hope I can soon book my next visit for summer 2016! Thank you! Hege's house was our best Airbnb stay! 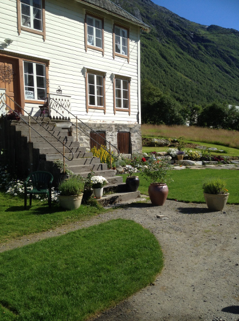 From the very beginning of the trip I was dreaming abound spending some time in the true Norwegian house and the dream came true. The place is amazing! It vintage but at the same time it's clean and cosy! Very romantic. There is lot's do thing to do there. You can walk around the mountains, you can play golf, or you can have some trips around Geirangerfjord. Hege was very friendly and we felt like we are at our Norwegian home. The breakfast was amazing, it was cooked with love and very very tasty and filling. My fiancee and I loved this place. Out of our entire trip through Norway, this was by far the best location. We stopped here on our way from Molde to Geiranger for the evening and were pleasantly surprised with this gem. Kristin and her family were very gracious hosts who made sure we knew exactly where to go and gave us great tips on how to get around the area and where we could pick up groceries. The bed was by far the highest quality on our trip. The next morning when we woke up we had a full blown Norwegian breakfast provided with our stay with fresh cut fruits, cheeses, meats, breads, tea, coffee and milk. I look forward to returning. At our arrival Hege Kristin was a perfect host, welcoming us 'home' and showing us the house. The house itself was the most charming place ever with lovely decorations, cosy rugs, warm materials and so much more. Even on the fifth (and last) day of our stay we discovered new little treasures. 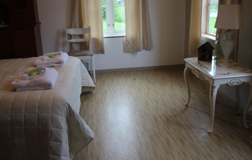 Everything was very clean and tidy and the bed was amazingly good. Hege Kristin and Stein are the most kind people, with their lovely son. Even with all the work they're doing they are taking the time to make us feel welcome, no question was too much. We even had a flat tyre and Stein was doing everything he could. Our stay here was amazing, but what we'll probably remember the best is the breakfast, no words can describe how perfectly this table was. A real pleasure and treat to be able to sit down at this table. Every morning our host took the time to get to know the new and old guests, always asking about our day, giving tips what to do, what to see.. Hours we've talked! I could go on and on telling how great this B&B is but hey, just discover it yourself, it's really worth it! We will be - most definitely - back! A beautiful, beautiful house. We were made to feel very welcome. The beds were the comfiest I have ever slept in - wish we could have stayed longer. And the breakfast was fantastic too. Definitely recommend. 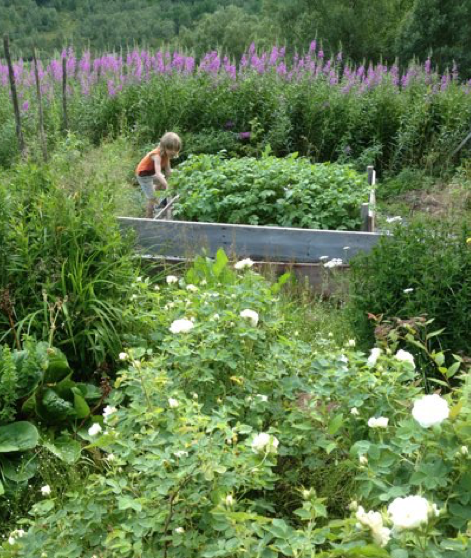 Vi har bodd mange plasser på våre reiser, men det å komme til Overvoll Farm var en sann fornøyelse! Å bli tatt i mot av Hege Kristin var som å bli invitert inn i hennes families hjem. Den gamle gården ligger idyllisk til i den frodige dalen med nyfrisert golfbane. Hovedhuset som er i stadig utbedring byr på doble værelser som bærer preg av mye historie. Vårt rom var nydelig innredet med eldre møbler og lamper. Sengen, sengetøyet, dynen og puter var deilige høykvalitets produkter, ja selv håndklær var av ypperste kvalitet. I andre etasje deler tre rom to nye og innbydende bad. Kjæresten min forelsket seg fullstendig i valg av fliser på gulv og vegger... Morgen etter våknet vi uthvilt til duften av kaffe og andre frokostlukter. Min bedre halvdel som hadde slitt med hodepine den siste uken kunne fortelle at den pinen var fullstendig borte. Frokosten ble servert på hvitduket langbord sammen med resten av gjestene som talte til sammen tre par. Som fagutdannet kokk ble dette en opplevelse! Her har vertinnen forstått hva som gjør en start på dagen minneverdig. Hjemmelaget rabarbrasyltetøy, tomatospray, pannekaker, diverse deilig oster og ikke minst varme hjemmelagde rundstykker... Jeg skriver dette i detalj da jeg ønsker å formidle dette fantastiske konsept. En verden der roen og varmen, som en ikke vil finne andre steder, er hva kropp og sinn lengter etter. Takk til Hege Kristin og hennes mann! Her skal vi tilbake! The host was exceptional- we were arriving late on a Sunday, and before we arrived she helped us find a decent restaurant on the way. Very interesting conversation (and the only bag of chamomile tea I saw in Norway). Highly recommended!